FILE PHOTO: Presidential candidate Jair Bolsonaro is greeted by supporters during an agribusiness fair in Esteio, Rio Grande do Sul state, Brazil Aug. 29, 2018. Brazilian far-right presidential candidate Jair Bolsonaro held a solid lead ahead of the Oct. 7 election following a near-fatal stabbing, but Workers Party (PT) candidate Fernando Haddad has emerged in second place, signaling a potential polarized right-left runoff, an opinion poll showed on Monday. The poll points to increased chances of Brazil's most uncertain election in a generation being decided between two candidates with no plans to deal with Brazil's unsustainable budget deficit. Bolsonaro, who is in the hospital and unable to campaign, took 28.2 percent of voter support, according to the survey by pollster MDA. Haddad, who replaced imprisoned former president Luiz Inacio Lula da Silva on the ticket last week, had 17.6 percent in his first showing in an MDA poll. Haddad's numbers indicate that Lula, who is banned from running because he was convicted for corruption, is successfully transferring enough votes to the former Sao Paulo mayor to face off with Bolsonaro in the second round in late October. Center-left populist Ciro Gomes had 10.8 percent and business-friendly candidate Geraldo Alckmin, favored by investors as the man who can restore fiscal discipline and business confidence, was fourth with 6.1 percent. 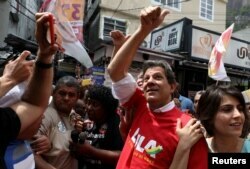 FILE PHOTO: Workers Party presidential candidate Fernando Haddad waves next to his vice presidential candidate Manuela d'Avila at the Rocinha slum in Rio de Janeiro, Brazil Sept. 14, 2018. Environmentalist Marina Silva trailed with 4.1 percent. "A second round between the far-right and the left will unsettle the markets, with implementation of pro-business reforms unlikely," said Carlos Caicedo, Associate Director for Latin America Country Risk at analytics data firm IHS Markit. Bolsonaro is still an unknown quantity who has not defined a clear economic program and whose nationalist views could pose a risk of trade protectionism that would increase capital outflows, Caicedo said in a note to clients. Lula's PT, on the other hand, opposes pension reform needed to curb the deficit. In a runoff, which would be triggered if no candidate wins half of the valid votes, Bolsonaro would defeat all other candidates except for Gomes, with whom he is statistically tied, the MDA poll said. One in four voters are still undecided or say they will annul or leave their ballot blank. Other opinion polls published by better-known pollsters last week showed Haddad beginning to gain traction, but Bolsonaro losing a runoff against most candidates. The nationwide MDA survey of 2,002 people was carried out for the transportation sector lobby CNT between Sept. 12 and 15 and had a margin of error of 2.2 percentage points, meaning results could vary that much either way.